GPS Databases are routinely wrong for the farm. Please use these directions. From Los Angeles & Points West: Take the I-10 or the I-60 towards Palm Spring. Exit on Hwy 79-Beaumont Avenue. Turn Left and proceed 8.4 miles until you see the sign that reads “Welcome to Oak Glen.” (Beaumont Ave./Road will become Oak Glen Road.) Look for the large, red-lettered “Riley’s Farm” sign on the right hand side of the road. From Palm Springs and Points East: Take the I-10 west towards Los Angeles. Exit on Beaumont Avenue. Turn Right and proceed approximately 8.4 miles, until you see the sign that reads “Welcome to Oak Glen.” (Beaumont Ave./Road will become Oak Glen Road.) 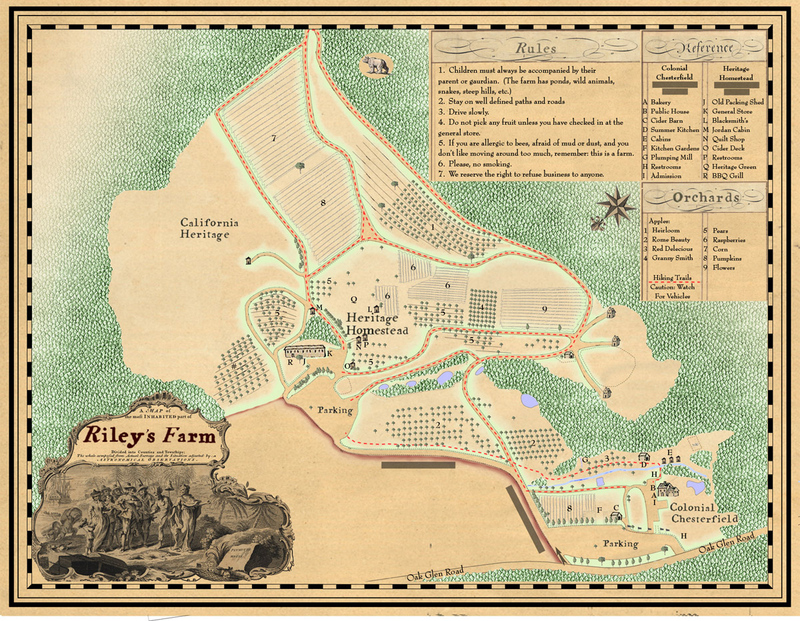 Look for the large, red-lettered “Riley’s Farm” sign and turn in to the right. Once You’re Here: The farm is a big place, so click on the graphic below to get your bearings. Hoe Downs and 19th Century events occur at the Old Packing Shed and guests should park in the upper parking lot. Colonial Events take place at the Chesterfield area and guests should park in the lower, roadside, parking lot..
GPS Users: you may wish to use “Yucaipa” or the zip code (92399) for locating us. 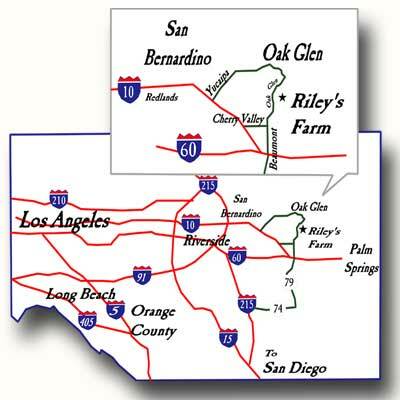 Oak Glen is an unincorporated county area near Yucaipa and it shares the same zip code.